While I desperately want to buy a few All Clad saute pans, I have nothing but good things to say about Cuisinart’s MultiClad line. I have used Cuisinart MultiClad pans for a few years now, and recently bought a new 3-1/2 quart stainless steel saute pan with cover and helper-handle. To be fair, I have had a positive experience with Cuisinart’s inexpensive Classic pans, but they feel a little light compared to MultiClad equivalents. The materials, joints, and even the handles feel different. The 3-1/2 quart saute pan is the perfect size for smaller dishes. While bigger is better normally applies to a lot of things, the 5-1/2 quart pan would be too oversized for small-to-medium sized meals. Not that the volume would be too big, but the footprint. Cuisinart MultiClad pans feature triple-ply stainless steel construction with a pure aluminum core for uniform heat distribution. What I like about this style pan is that it comes with a cover – which is used more often than not – and an auxiliary handle that is well appreciated when moving a fully loaded pan. This pan isn’t exactly cheap at $80, but its versatility makes it a justified expense. 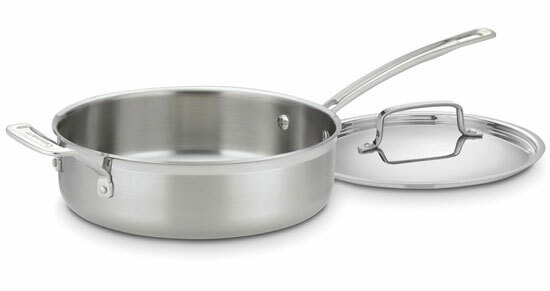 I’m still pining for the All Clad 3 quart pan ($140 via Amazon), but the Cuisinart MultiClad pan doesn’t exactly leave me at all wanting for more. The All Clad pan is currently selling for $99 on Amazon. Quite a deal! Thanks for the update! I noticed the new lower price the other day in my Amazon cart, but couldn’t quite bring myself to buy it. Maybe I’ll save up some credit card reward points to buy it with. Once you start cooking with All Clad you will never be happy with anything else. It really is that good.